Thousands of public school teachers and their supporters protested against a pension reform bill at the Kentucky state Capitol in April. The state's Supreme Court has now struck down the law. On March 29, after previous versions of the legislation had stalled, the Republican majority turned what had been an 11-page sewer bill into a 291-page pension bill and passed it in just hours. Kentucky law requires a bill to be read three times over three different days; the legislature tried to claim that readings when it was still a sewer bill counted, but the judge disagreed. Republican Gov. Matt Bevin signed the bill into law in April, but a circuit court judge struck it down in June, ruling that lawmakers had violated the Kentucky Constitution in the process they used to pass the bill. With its decision Thursday, the Kentucky Supreme Court has upheld that judge's ruling, marking a major victory for state employees, as well as for Democratic Attorney General Andy Beshear, who had challenged the law. The decision may have political consequences: Bevin says he will seek re-election, and Beshear plans to run for the governorship, as well. Kentucky House Republicans released a statement critical of the Supreme Court's ruling, saying the decision shows "a complete and total lack of understanding for the separation of powers." Bevin called the ruling "an unprecedented power grab by activist judges." Beshear, meanwhile, hailed it as "a landmark win." "The pension law would have changed how current workers can use saved-up sick days to qualify for retirement, and required employees hired between 2003 and 2008 to pay 1 percent of their salaries for retiree health insurance. "Future teachers would no longer receive defined benefit pensions that guarantee benefits from the point of retirement until death, instead receiving 'hybrid cash-balance' plans that rely on stock market growth. "Some state workers hired since 2014 would also have the guaranteed rate of return into their hybrid plans reduced from 4 percent to 0 percent." "Independent consultants said last month that the system has more money and less unfunded debt since the legislature decided to fully fund the system's budget request. 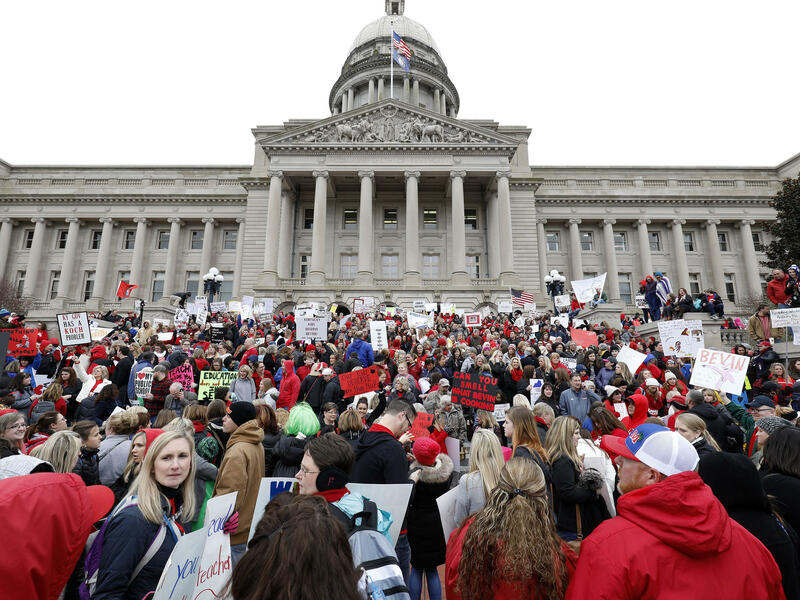 Kentucky Teachers' Retirement System Executive Secretary Gary Harbin told reporters the fate of the pension bill would have little effect on the system's future solvency."